Still Waiting for Your Liquid Nitrogen Delivery? It's no fun when your production operations are interrupted or shut down because your liquid Nitrogen delivery was delayed by traffic or weather, or ends up outside your storage tank rather than in it. 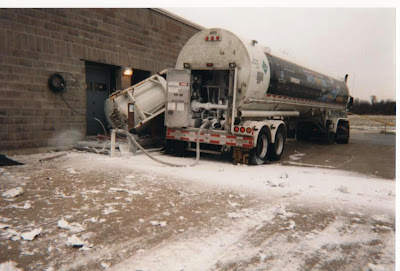 That is exactly what happened to the unlucky customer in this picture, when the offload of the Nitrogen from the tanker truck to the storage tank failed. With a Nitrogen generator, interruptions due to empties and missed or delayed deliveries are a thing of the past. Instead of liquid Nitrogen, all you need is air to generate all the Nitrogen gas you need, when you need it. By opting for a Nitrogen Generator, you also eliminate all those extra fees that come with your gas contract - for tank rental, gas surcharges, hazmat charge, low volume surcharges, labor and delivery - that inflate your monthly costs even more. Don't be left in the cold. Visit our website today and discover the convenience, cost-effectiveness and reliability of a Nitrogen Generator from South-Tek Systems. Incubators in which embryos are cultured during IVF require keeping the oxygen content to only 5%, vs. the 20% that is in air. To ensure that too much oxygen is not delivered to these cells, a constant stream of pure nitrogen gas must be constantly blown through the incubator at a carefully controlled rate. The lowered oxygen concentration in the incubator more closely mimics the conditions present in the fallopian tubes and uterus of a fertile woman. This results in safely culturing embryos until implantation, and higher pregnancy rates. The large amounts of pure Nitrogen necessary for this constant rate of flow can be difficult and costly to obtain if you must depend on delivery of bottled gases from a supplier. A Nitrogen Gas generator ensures that you have the Nitrogen you need in response to demand, at the cost of only the electricity needed to run the air compressor. And no more figuring out how and where to store high pressure tanks! South-Tek Systems will provide you with expert guidance in choosing the right Nitrogen Generator for your laboratory and show you how to start saving money today. Nitrogen Generators Make Better Olive Oil! Longer mixing times during olive oil production increase yield and help the oil pick up minor components which can improve flavor. Longer mixing, however, can result in oxidation and decreased shelf life if the mixed paste comes in contact with air. Use of closed mixing chambers "blanketed" with an inert gas such as Nitrogen during the mixing cycle allow increased yield and flavor without the danger of oxidation. Nitrogen is also used for sparging at bottling time, which further delays oxidation and rancidity. A Nitrogen Generator is a cost effective means of producing the Nitrogen needed without the hassle of ordering from a gas supplier, or finding space to safely store bottles and cylinders of liquid Nitrogen. Nitrogen Generators typically result in savings as much as 90% over liquid. To find out how a Nitrogen Generator can save money for your business, contact the South-Tek Team online, or call us at 910-332-4173. High humidity and water vapor can negatively affect the use, operation and long term reliability of many instruments and systems. Nitrogen purging removes moisture and inhibits oxygen production in electronic, optical, and high voltage equipment, as well as in storage containers where it is necessary to prevent air from coming in contact with stored materials. Because purging is a continuous process, large amounts of Nitrogen are often necessary, and flow must be uninterrupted. This can become costly for industries relying on gas companies for supplies of liquid Nitrogen. Users of Nitrogen in high volumes will find it worth their while to investigate switching to an onsite Nitrogen Gas Generator for their gas supply. ROI is often no more than 1-2 years, effectively reducing operating costs for the short and long term. Nitrogen Generators are also reliable and convenient, providing desired levels and purity of Nitrogen without interruption. Find out here if you can save money and never run out of Nitrogen again! A dry box is a completely enclosed chamber designed for working in a preferred atmosphere, which is inerted using Nitrogen. Because the boxes are constructed of acrylic polymers, they are permeable to moisture. Continuous purging of the chambers with Nitrogen gas keeps the moisture levels at their lowest possible percentage. This continuous flow, however, requires large amounts of Nitrogen to maintain constant low moisure levels. Opening the chamber to add or remove samples also adds to the Nitrogen use rate. This means that laboratories are often faced with high monthly bills from their gas suppliers, may face problematic interruptions in Nitrogen flow from depletion of gas bottles on hand, and also must accommodate hazardous storage procedures since Nitrogen is bottled under extremely high pressure. Because it produces an uninterrupted supply of Nitrogen from the air, a Nitrogen Gas generator completely eliminates these problems, takes up far less space than all those bottles and cylinders, and Nitrogen gas costs become part of the electric bill at a far lower rate. There is no downtime from empties or late deliveries, no need to store hazardous liquid Nitrogen bottles and cylinders, and there is always a ready supply of Nitrogen on hand. See why a Nitrogen Generator will help you keep your laboratory operating costs down, and keep your Nitrogen flowing at the rate you need. Contact South-Tek Systems online, or call 888-526-2684. All the best from the South-Tek Team! Nitrogen Gas from a Nitrogen Generator is used in wine production in several ways. Sparging involves the introduction of very fine gas bubbles to help remove dissolved oxygen or CO2, or sometimes to add CO2. Blanketing attempts to maintain a Nitrogen Gas layer above the wine surface in order to minimize the contact of air with the wine. To prevent the growth of aerobic microorganisms on the wine surface, the O2 concentration must be reduced from the levels found in air to less than 0.5% on the wine's surface. Just prior to bottling, air must be flushed from hoses, filter housing pumps, and the fill bowl by using a displacement gas such as Nitrogen, since the amount of oxygen in wine can influence wine quality, stability, and longevity. Nitrogen is preferred for these applications because it has a very low solubility in wine. It is also available very economically via a Nitrogen Generator, which makes Nitrogen out of air and eliminates the need for a gas supplier, and for storage of bottles and tanks of liquid Nitrogen. Nitrogen Generators are also convenient for wine makers, because Nitrogen is made as needed, and the Nitrogen requirements for wine bottling may vary at different times of the year. Visit us on the Web to learn more about how a Nitrogen Generator can benefit your production line, and your bottom line! Make Your Own Nitrogen and End Your Gas Contract TODAY! A Nitrogen Generator can cut your Nitrogen Gas costs up to 90%, and leasing your generator provides even greater financial incentives to make the switch from using a gas supplier. Right now, you are paying the gas company up to thousands of dollars each month to get your Nitrogen supply - and nothing else. You are also faced with gas taxes, tank leasing fees, contract management costs – your money just goes out the door, and the list of expenses goes on and on. By diverting those monthly payments into a lease purchase option for a Nitrogen Generator, you will own your own equipment and never have to rely on gas deliveries again. You are using money you are already spending, to purchase your own equipment. Lease payments are spread over 3, 4 or 5 years and, since you have a capital lease, you also have a depreciable asset. You can start writing off your purchase the very first year of your lease. Choose no downpayment, or put down a percentage that will help control your monthly costs. Instead of paying an unending cycle of monthly gas bills, at the end of the lease, buy your Nitrogen Generator for $1 and then STOP making payments - forever! Your Nitrogen gas costs are then covered by your monthly electricity bill, and there are no additional leasing payments, gas taxes, or administrative costs. Remember, to get a “good deal” from your gas company, they will require at least a 5 year contract, and at the end of the contract all you get is an increase in Nitrogen cost. Why not lease a generator at a lower monthly expense and then OWN your own Nitrogen generating system? Leasing a Nitrogen Gas Generator from South-Tek Systems will lower your operating expenses and give you a reliable, safe, unlimited supply of Nitrogen. 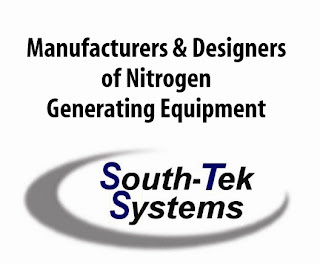 To find out more about the financial benefits of purchasing or leasing a Nitrogen Generator for your company, contact South-Tek Systems at 888-526-2684, or visit us on the web at http://www.southteksystems.com/.